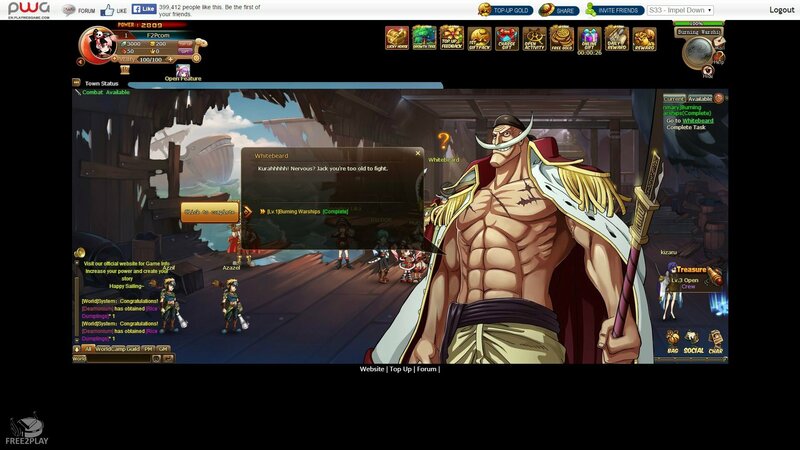 The game is inspired by One Piece, a Japanese manga/anime in which players play as pirate captains who are in command of his own ship and crew, which must evade the forces of the law. 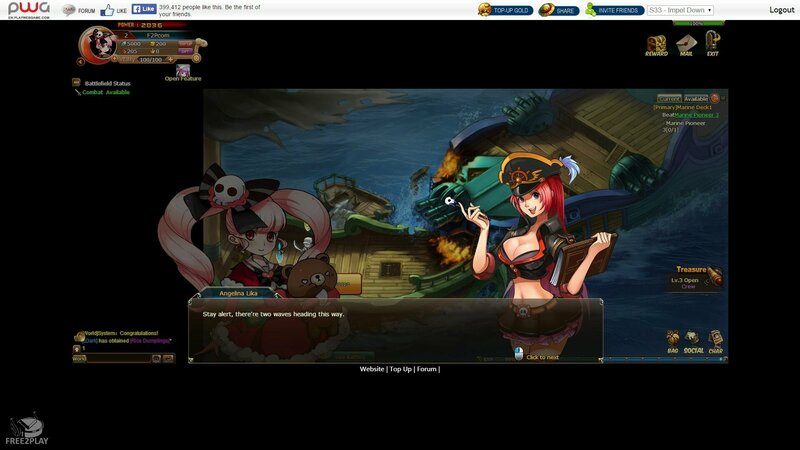 Anime Pirates is a free to play MMORPG with strategic turn-based fights in which players can fight against AI threats and other players. The game is available for internet browsers although it is possible to download a client. Just as he was about to be executed Gol D. Roger, the legendary Pirate King, mentioned his amassed treasure hoard that he had gathered over his lifetime and informed the world that it was all hidden in one place available to the lucky crew that could find it. Everyone who could afford to get a ship and train a crew, headed off on an epic journey in search of this great treasure. 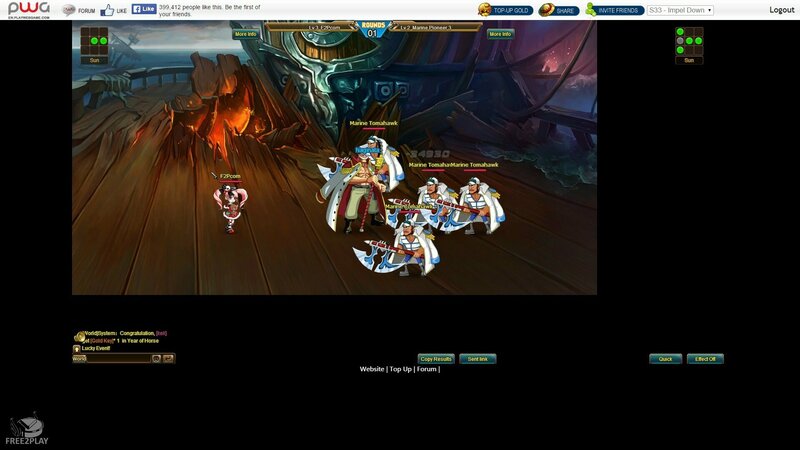 Our goal in the game is to form a crew consisting of several members who will accompany you on your journey, by completing missions, battling through Dungeons or fighting against other players in the arena. You have to find stronger members for your crew if you want to become the next pirate King, the highest ranked player in the game. Summoner - This little girl and her teddy bear, his transformed brother, has joined the great adventure to find a cure to the condition of his brother. Archer - This girl from the Sky Island loves to find rare items and add them to her collection, and without doubt there are a more than a few interesting ones among the treasures of Gol D. Roger. Swordswoman - A former Admiral of the Navy who was duped by his superiors, making her a fugitive of the World Government. Now she seeks to clear his name. Warrior - A brave young man from the desert that is completing a mission given from their tribal elders, find the treasure of Gol D. Roger and return prosperity to his people. Magician - This mysterious man accompanied by his faithful Luojia bird, wants to find out more about his past and the origin of his mysterious magical powers. Players will come across various NPC's as they journey across the world in search of adventure, many of who will be willing to join the player and aid them in combat. Each potential Crew has their own requirements before they will join a player and each has their own attributes and abilities that they can lend in a battle providing they are in the most optimal position in a Combat Formation. In the game there are various Battle Formations available which determine the pattern/layout that Crew are positioned in when they enter battle e.g. a heavy front line focusing on defence or a heavy backline focusing on ranged attack and DPS. With 5 positions available in each formation, players must choose their optimal five Crew to fill the positions to try and get the most from them both individually and as a team.